Thank You For You Booking Enquiry! Thank You For Your Free ISO Consultation Request! Get Your Business ETP 1000:2012 Certified! Get Your Business ISO 13485 Certified! Get Your Business ISO 14001 Certified! Get Your Business ISO 20121:2012 Certified! Get Your Business ISO 27001 Certified! Get your Business ISO 50001 Certified! Get Your Business ISO 9001 Certified! 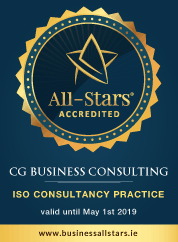 Why work with CG Business Consulting?